General Information on Jamaica | Jamaican Airport Shuttles, Transfers &Tours. Jamaica is the third largest Island in the Caribbean. It is approximately 4243 square milses in size, 51 miles wide by 146 miles long and more than 7200 feet at its highest point. It is the third largest Caribbean island and the largest English speaking island. It has the seventh largest natural harbor in the world. "Out of many, one people" The Jamaican Motto. From its beginnings as a major point in the American slave trade to its multiracial society of today, Jamaica has come a long way in a relatively short time. Jamaica’s population consists mostly of descendants of African blacks, plus several small East Indian, Chinese, and European minorities. The official language of Jamaica is English, but "patois" is widely spoken. The climate is of course tropical with seasonal rainfall. It ranges from humid at sea-level with beautiful sea breezes to temperate to cool in the mountains. The average temperature is around 80 degrees. Mean temperature on the coast range from 81 degrees Fahrenheit/24 degrees Celsius in February to 82 degrees Fahrenheit/27 degrees Celsius in August. Our Blue Mountain Range soars high over Kingston, with great camping and hiking opportunities. Check the central mountains. beautiful beaches can be found in every part of our island. Check the waters in the north eastern part of Jamaica for major snorkeling, the north and north eastern shores of the island for beaches and fun shopping, the western Negril shores for one of the world's greatest sunsets and coral reefs, and our southern shores for vast and private white sand beaches. Jamaica has more than 200 species of birds, including the "doctor bird" a beautiful hummingbird which is the national bird. There are no venomous reptiles. Mongooses run wild. There are crocodiles, but they do not run freely throughout the island. Take any one of our exciting river raft rides to view these unique and beautiful creatures. Among the plants are the vivid red Poinciana, the yellow poui, and the blue lignum vitae, which is Jamaica’s national tree. The Blue Mountains offer spectacular beauty, and the world’s finest coffee. Our rich soils boast the most colorful of flowering plants with bougainvillia richer colored than you will see world wide. 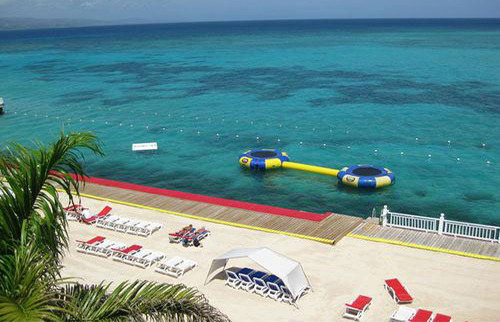 The beaches are probably the most popular part of Jamaica with our guests. The village of Negril on our west coast boasts seven miles of white sand beach. All other resort areas also have there own mix of rugged coastline and spectacular white sand or black sand beaches. Tour our island and pick conch from the shoreline, snorkel or dive along our beautiful reefs, leap from our exquisite cliffs into the blue Caribbean Sea. In recent years marine parks have been set up in major tourist areas to protect the coral reefs, these initiatives have been quite successful in guaranteeing a future for our most valuable underwater resource. Jamaica’s largest export today is incredible vacation memories. In recent years tourism has grown to become the largest industry in Jamaica. The prospective vacationer will find a wide variety of vacation experiences. 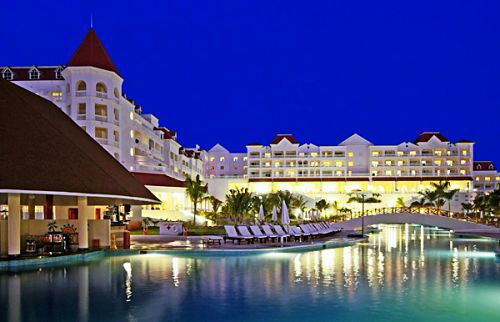 On the north coast can be found some of the largest and plushest resorts in the Caribbean. Scattered throughout the island are dozens of smaller more intimate hotels and guest houses. About one fourth of all Jamaicans depend upon agriculture for a living. There are a thousand or so large estates that control about half the farm land and the other half is broken up into about around 200,000 small farms. Major crops include sugarcane, fruits, coffee, bananas, pimentos, cattle much of which is exported. Jamaica is one of the top producers of bauxite and alumina in the world. Several international aluminum companies mine deposits of bauxite on the central plateaus. Some of them process the bauxite into aluminum. The original inhabitants of Jamaica in modern times were the Taino Indians. In the two centuries of Spanish rule that began with the arrival of Christopher Columbus on May 4, 1494, the peaceful Tainoes were eliminated. From 1509-1655 the island was inhabited by the Spanish. The Spanish brought large numbers of African slaves to the island. A British force invaded the country in 1655, and Jamaica remained a British colony until 1962. During the 18th century the slave trade was greatly expanded to accommodate the needs of the huge plantations. The abolition of slavery began in the 1830’s and was completely abolished by 1839. By 1840 indentured laborers were brought in from India to replace the newly freed slaves many of whom relocated to free settlements in central Jamaica. In the 1930s Sir Alexander Bustamante founded the Jamaica Labour Party and later led the country to independence. Norman Washington Manley (Bustamante’s cousin) formed the People's National Party. In 1962, Jamaica achieved its independence from England. Jamaica is a parliamentary democracy, modeled after that in Great Britain. Jamaica belongs to the Commonwealth. The head of state is the governor-general, who is appointed by the monarch of England. The prime minister is the leader of the majority party in the House of Representatives. The present prime minister is his most honorable Bruce Golding, member of the Jamaica Labor party (JLP), and re-elected in 2007, by democratic election. The opposition party is the National Peoples Party (PNP). Planning your Jamaica vacation is now easy, quick and affordable, now you can plan your Jamaican getaway and find great deals on all your travel needs in one location, check out our variety of services to guarantee a great experience. Get the best vacation ideas for your trip to Jamaica, plan your trip when you are visiting Montego Bay, Negril, Ocho Rios, Kingston and many more locations island wide, find airport and hotel transfers for popular affordable resorts at Jamaica Customized Vacations & Tours.